Well, this is the seventh Chelsea backpack from Lazy Girl Designs I've made in the past year . . . this one is for my SIL Laurie. Her two girls, Elora and Jenna received Chelsea backpacks for their birthdays in November and March. You can see them all in my Chelsea Backpack set on Flickr. I noticed Laurie "borrowing" one of the girls' backpacks on several occasions and when I asked if she'd like one of her own, she said I didn't have to make one for her, but if I did, she'd like it brown on the outside (to hide the dirt) and yellow on the inside. I make these with home dec fabrics for the outside cover, usually a corduroy type of material, and I try to use some hip cotton novelty fabrics for the inside lining and pockets, then I add machine embroidery to the outside pocket to personalize each bag. But yellow is not one of my colors, so I had a hard time finding the right fabrics for the inside of this bag. A few weeks ago, Jenna asked me if I'd started on her mom's backpack yet. Not yet, I said . . . what color do think she'd like? Jenna said it should be something that stands out. I asked Laurie's sister for her opinion and she said maybe something muted would be best. Hmmm, yellow that stands out but is muted . . . Earlier this week I visited the Cozy Quilt Shoppe and found the perfect fabrics. When I walked in the door, right near the front of the shop was a bolt of fabric with anchors on a sandy-yellow background. Laurie lives at the beach, so I thought maybe I could find a couple of fabrics that coordinate with this and I'd be all set. I looked at each and every yellow bolt of fabric in that shop . 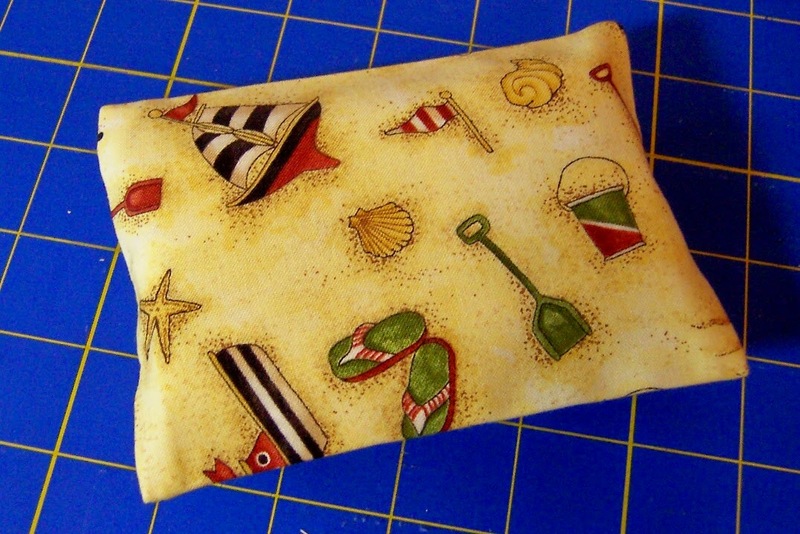 . . then I looked in the remnant bin and found a coordinating beach themed fabric that was perfect. I also picked up a fat quarter of a matching batik fabric for the outer pocket flap and the shoulder strap loop. 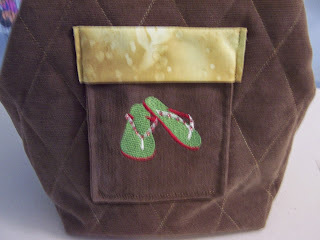 I usually embroider an initial on the outside pocket, but I couldn't find a monogram I liked that matched a beach theme. 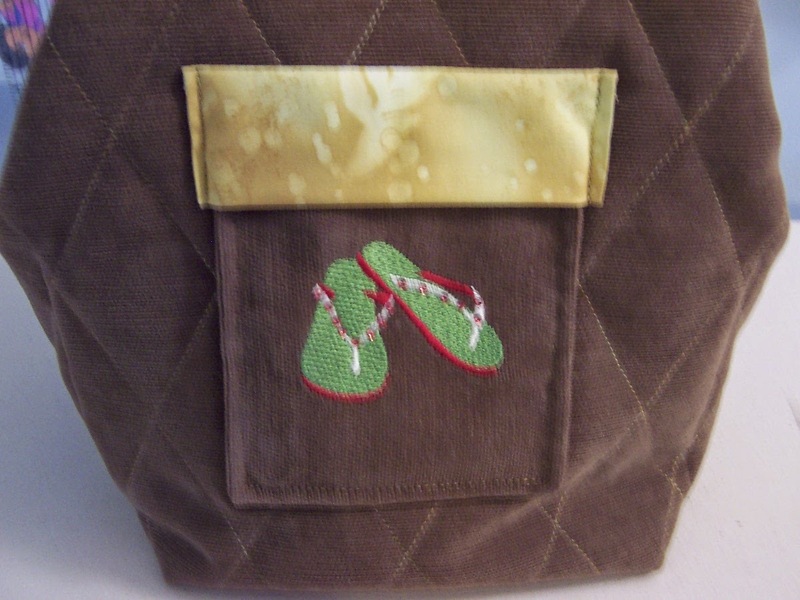 I did find a flip flop design in my collection (a free design from Husqvarna Viking in 2006) that I edited so that the colors match the flip flops in the lining fabric. But something was still missing . . . the flip flops needed red stripes and mine were solid white. So I pulled out some hot fix crystals and added little red "bling" dots. I used a yellow zipper for the shoulder strap; after the bag was completed, I realized I'd put the strap in with the wrong side on the front so it zips from the inside. I don't think Laurie will mind . . . we'll call it a "design variation". I also experimented with the inside pockets to make them go all the way around the bag; more room for stuff. One last detail I added was a loop and lobster claw clip for attaching keys. Mine are always getting lost at the bottom of my bag and I found that one of the clips works great. I wish I had a gold colored clip, because I think it would match the bag better. See how the flip flops match the embroidery? 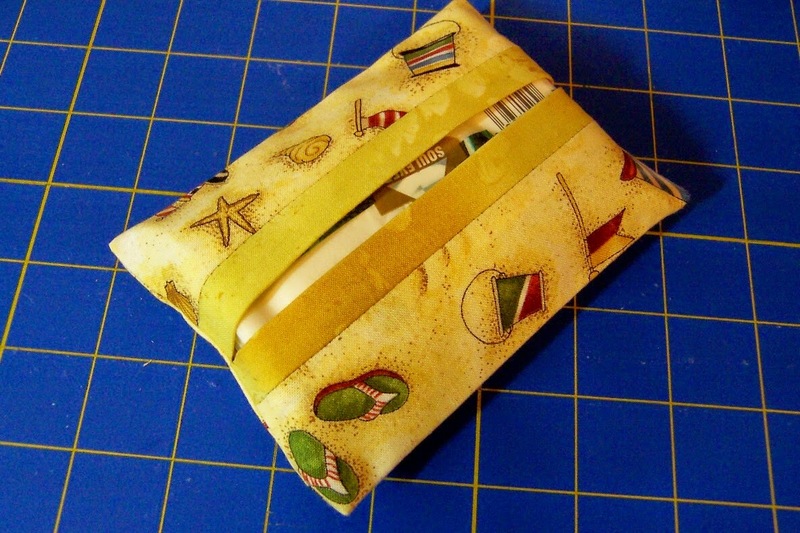 I didn't make a Wonder Wallet this time . . .shhh! Christmas is coming! So -- brown outside, yellow inside, stands out but is muted . . . I think I got all that covered. Laurie's birthday is in September, and we'll be seeing her over Labor Day weekend so I'll deliver the bag this weekend. I hope she likes it . . .